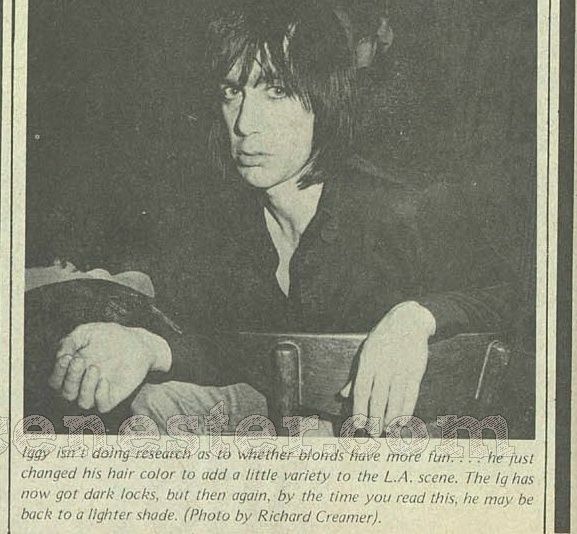 I found a cool blog the other day which has a couple of stories about Iggy in LA post the breakup of the Stooges in '74. He was living in the garage of a photographer called Jim Cassatta and the blog is by his daughter Sydney. 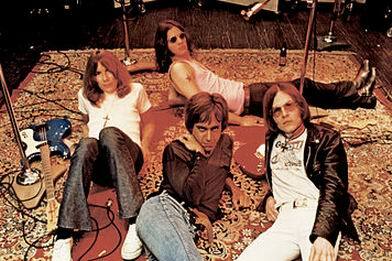 ((1) Eric Wonderman was sitting in the living room, Iggy Pop knocked on the door and asked if dad had any vitamins. Dad said, yes, they are in the bathroom. Iggy Pop entered, found the bathroom, took the vitamins and asked if there was any beer. Dad said no, sorry, at this point in life he was no longer drinking. There was however a liquor store right across the street. So Iggy asked if dad had $1.35. Sadly, dad could not help here either. Iggy then turned to Eric and asked if he had the $1.35 for beer (it was only a dollar thirty five for beer! Crazy.) he didn't have it either. Iggy left. Dad looked at Eric in confusion, Eric asked if he knew who that was, dad said no. 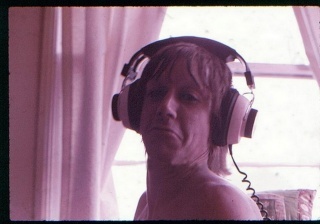 Eric informed him that it was, in fact, Iggy Pop and thus begins the whole sordid affair. Iggy and dad would be friends for a few years after and he is the person I have the most photos and goodies of. More to come! 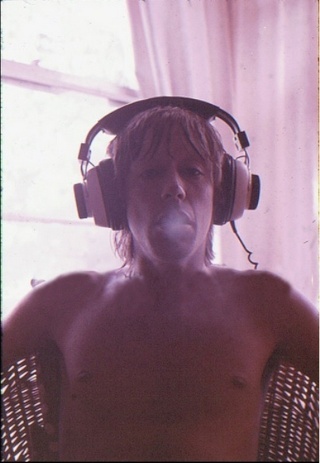 He then took to living in the garage from, '74 to '75 I believe, before disappearing in 1976 with David Bowie to record The Idiot and, get their heads together. P.S. Here's a pic of me and Miss Pamela at the Whiskey to see my friend Aynsley Dunbar play with Journey. Don't she look cute?" Isn't this amazing?! I was blown away! 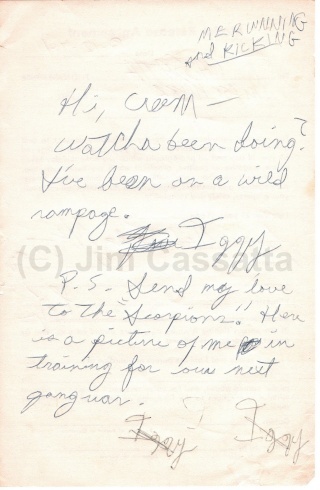 How great to find out that not only did Iggy write to people, he included pictures! He just went up a cool notch (as if it was even possible for him to be more cool). 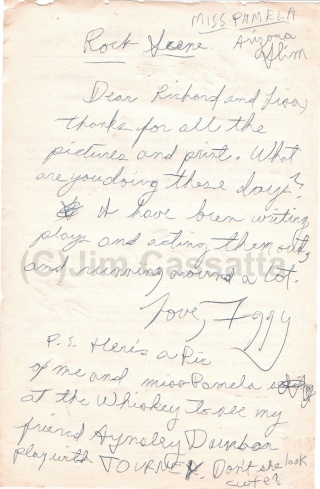 I do not have a picture of Iggy and Miss Pamela, so maybe this was a practice letter and he sent the real one with the picture? He must of course mean the fabulous groupie deluxe Pamela Des Barres when he says "Miss Pamela". Whatcha been doing? I've been on a wild rampage. P.S. send my love to the "Scorpions." Here is a picture of me in training for our next gang war. Iggy (it's scratched out) Iggy (scratched out again)"
It's a shame that Sydney stopped posting on the blog as it sounds like she has more Iggy stuff. I tried contacting her but no response. 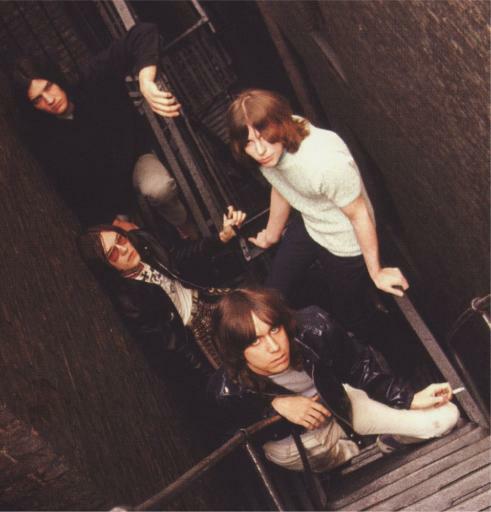 I love the line - Hi Creem, whatcha been doing? I've been on a wild rampage. And I bet he had been if the stories in Danny Sugarmans' Wonderland Avenue can be believed. Wish there was more known about the 1974/75 period.